For me the best vegetable to include in sinigang na bangus is the kamote (sweet potato) tops (talbos ng kamote) or kangkong (swamp cabbage). If talbos ng kamote is not available, petsay can also be the best substitute for sinigang na bangus. Sometimes when it is available, I also put raw or not ripe banana (saging na saba). This is good to remove the fishy smell and taste of the soup aside from the ginger. Click here for the recipe of “Paksiw na Bangus”. 1) In a pot, pour 1 cup of water, salt, a pinch of magic sarap, onion, ginger, sampalok/tamarind and bangus. 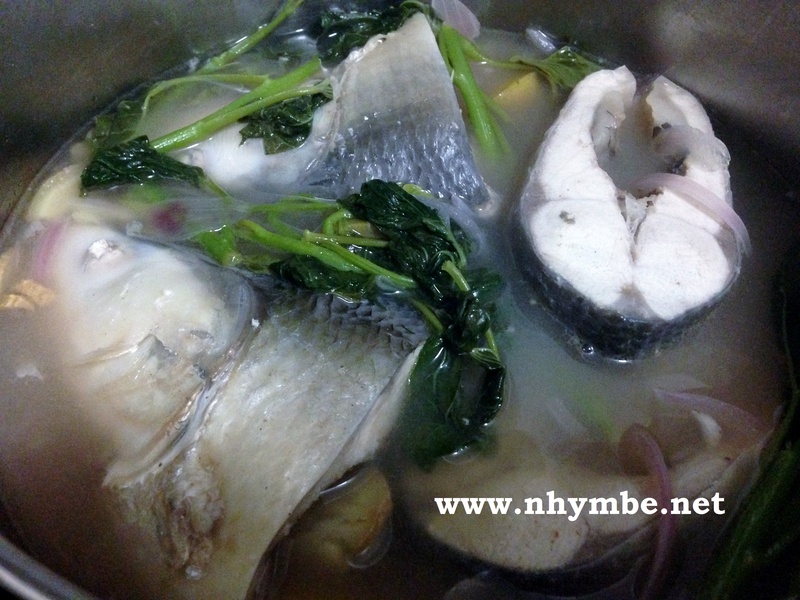 2) Let it boil for 5-10 minutes to make the saltiness and sourness absorbed by the milkfish. 3) Add the remaining water and let it boil. Add the banana and kamote tops. 5) Serve hot and with rice. Enjoy!